This past weekend has, once again, provided a sad example of the urgent need for civility – not as a means of policy negotiation or a form of politeness, but as an antidote to hatred and violence. This is what happened: last Saturday, at Pearson Park in Anaheim, California, members of the Ku Klux Klan clashed violently with counter-protesters at what Klan supporters described as a white lives matter rally. According to reporting from Vibe.com, the rally was aimed at raising awareness against “illegal immigration and Muslims”. Protesters arrived on the scene hours before the event was scheduled to begin, and as Klansmen exited their SUV, donning Confederate flag patches, the counter-protesters, who were reportedly armed with two-by-fours, approached them. The resulting melee left three people stabbed and 13 people arrested. As The New York Times reports, one Klan supporter waved a flagpole bearing the American flag as a weapon. Klan members carried signs with slogans including “White Lives Do Matter Say No To Cultural Genocide.” And one carried the Confederate battle flag. The protesters seem to have been instigators of the physical assault. And in one video of the violence, after the Ku Klux Klan SUV had sped away, one stood over a stranded Klan member and, enraged, yelled: Your own white people left you! In an interview with Southern California radio station KPCC, Anaheim Mayor Tom Tait said that this sort of incident is not an accurate reflection at all of who we are in Anaheim. He called Anaheim one of the most ethnically diverse cities in the United States and a city of respect and tolerance and kindness. But while everything Mayor Tait said may be true of Anaheim under ordinary circumstances, if we can learn anything from what happened, it’s that denial and an affirmation of the people’s generous spirit is not enough. Violence like this is not an isolated event. It exists as part of an escalating cycle of hatred. And, sadly, it has deep roots in the United States. 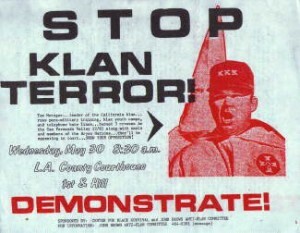 Even just in Anaheim, The Los Angeles Times reports, there is a long and troubling history with the Ku Klux Klan. They write that Klansmen were once the dominant political force in Anaheim, holding four of five City Council seats through the early 1920s, and drawing tens of thousands of participants to their rallies. And they write that in 2003, an eight-foot cross was burned outside the home of a black man. But even this is not the most immediate context for what happened at Pearson Park. If we pay attention to the rhetoric of the Klansmen, we find its roots much closer to home – in the incivility and angry rhetoric that characterizes our current presidential election cycle. The Klansmen in Pearson park claimed to be concerned about Muslims and immigrants. Well, over the past several months, we have seen specific language from presidential candidates that vilifies both groups: we have heard proposals to ban all Muslims from entering the United States; claims that immigrants from Mexico are rapists and murderers; and in the context of the Syrian refugee crisis, suggestions that the United States should only accept immigrants who can prove that they are Christians, because non-Christians are more likely to be violent extremists. The Klansmen called themselves a “white lives matter” protest. At campaign events, we have seen physical altercations between Black Lives Matter activists and rally-goers; we have seen calls of all lives matter – some well-intentioned, and some not; and we have seen candidates repeatedly deny the existence of the pattern of police violence that spawned the movement in the first place. And the fact that this group identified itself as Klan-affiliated at all is not insignificant. Recently, we have seen the media offer broad publicity for the political endorsements of white supremacist leaders like Klan Grand Wizard David Duke. Not positive publicity, but much more airtime than most other political endorsements garner. The problem at Pearson Park – as Anaheim’s Mayor Tait seemed to understand in the framing of his comments – is not the impulse to stand against hate. That is invaluable. The problem is that while the impulse to meet hatred with violence may seem satisfying in the moment, it is profoundly unproductive. It crystallizes the most intolerant feelings and impulses on every side, it leads to escalation, and it shuts down the possibility of communication. No amount of beating can expunge hate. But neither can the response to this incident be nominal civility via another impotent cry of “can’t we all just get along?” There is always need for greater kindness and more courtesy, but requiring we not say those things that might offend leads to frustration, not resolution. Which is why scorn for political correctness has been such an effective campaign tool in this current election cycle. Instead, one way forward may be the sort of civility that allows us to perceive the humanity in those we think of as our enemies, and to take their needs and beliefs seriously. According to The O.C. Weekly, one speaker at a peace rally following the incident in Pearson Park invoked the spirit of Dr. Martin Luther King Jr. quoting the slain civil rights leader when he said, “Let no man pull you so low as to hate him.” This is on the right track. Helps us to see the enemy’s point of view, to hear his questions, to know his assessment of ourselves. For from his view we may indeed see the basic weaknesses of our own condition, and if we are mature, we may learn and grow and profit from the wisdom of the brothers who are called the opposition. And this is ultimately key. As we saw this past weekend, violent words breed only more violent words and ultimately violent deeds. But if instead we meet hatred with a question – if we require our opponents to account for themselves and their hate – we humanize them, and we humanize ourselves to them. Change by this route is slow, and it will frustrate us at every turn. But it is a process of teaching our opponents to see their own positions as we see them. And that, more than any violence, has the potential to undo hate.